Carol's Theatre Reviews ~ It's Fun To Go Out: “Gidion’s Knot” is a tangled mess with no easy solutions. “Gidion’s Knot” is a tangled mess with no easy solutions. Twenty-five minutes can seem like a lifetime or a fleeting moment. 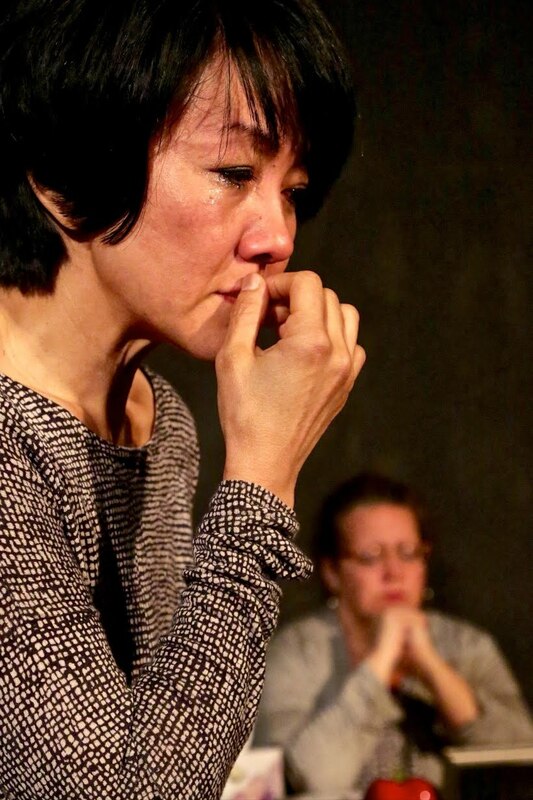 In Johanna Adams’ “Gidion’s Knot” now in a tense and emotionally exhausting production directed by Kym Pappas and starring Carla Nell (co- artistic director) and Jyl Kaneshiro, it seems like a lifetime to Heather, Gidion’s fifth grade teacher and not enough time to Corynn, Gidion’s mother. 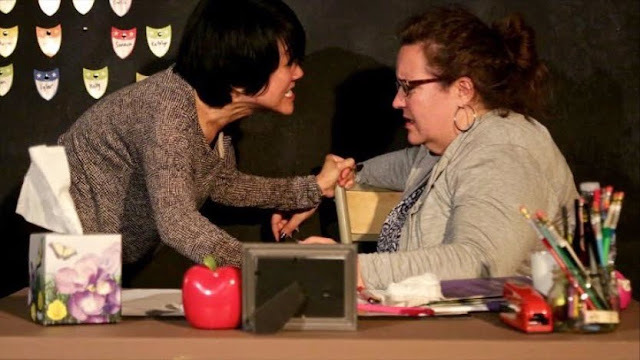 Adams’ eighty minute play touches on a series of topics dealing with cyber-bullying, schoolyard bullying, parental bullying, supervised parent-teacher conferences and school projects to mention a few. Heather’s lack of experience as a teacher (she has just two years in) avoids answering at all costs. While Corynn trolls the fifth grade classroom like an aggressive warrior waiting to pounce, Heather shies back into a fetal like position behind her desk hoping time will be on her side and Corynn will give up and leave. Answers to questions come in bits and pieces. 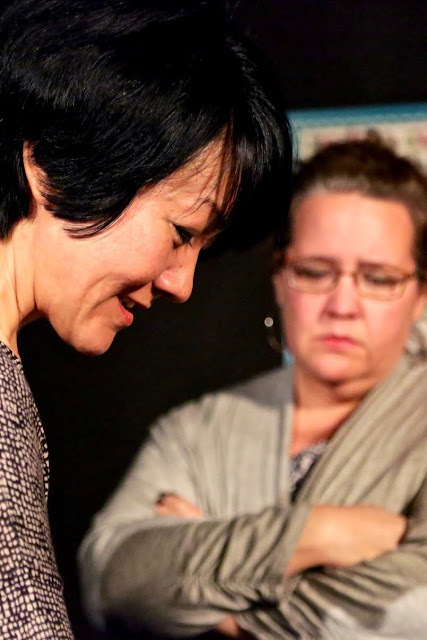 Kaneshiro’s Corynn rides an emotional roller coaster on what she eventually learns about her son and Nell’s Heather is an emotional wreck at plays end. The unseen but center of attention Gidion, comes to life in what’s said and not said about him by both women. Some of his classmates have some choice words about him as well. What prompted the visit and what came out of it are the set ups for the real questions of how much we really know about our kids and how much influence and or personal likes and dislikes teachers have over the behavior of their students. To the point, is freedom of expression, positive or negative, part of the package when the schools have an agenda and the kids don’t follow along? Corynn, a professor of Medieval and earlier forms of literature, is positive her son’s essay is the work of a creative mind that should not be boxed in by narrow-mindedness. Heather, on the other hand is appalled at the subject matter and the graphic and gruesome descriptions Gidion uses to express himself. Corynn thinks he’s a genius. His essay is ‘beautiful’. Heather counters, “I disagree.” Both have a point of view depending on which side of the desk one sits and how emotionally solid each is in their convictions. You be the judge. InnerMission’s tiny black box space is shared with Diversionary Theatre located in back of the larger theatre. The small space is depicted as a fifth grade classroom with Heather’s desk in front of a white board facing the audience/students. Hanging on the walls are formula for writing essays, good citizen guide -lines and student essays about Gordion’s Knot are tacked onto cork frames. Around the ceilings pictures of the Greek gods cover the walls in every direction. (Robert Malave). Jyl Kaneshiro is comfortable in her own skin and surroundings. Hers is a force of nature at odds with her small frame. But don’t let looks deceive. Carla Nell's Heather is ill at ease pulling continually at her sweater while measuring her surroundings. Corynn knows her way around the classroom even though it’s not hers. And while the room physically belongs to Heather, she is constantly looking for an escape route either by checking her watch or waiting for her phone to ring. Adams is no stranger to San Diego audiences. In 2013 Moxie Theatre mounted the west coast premiere of “Skinless” a little gothic mystery/horror story. “Gidion’s Knot” is not quite gothic but if you are in Heather’s chair, it could become a horror story in its own right. On the other hand, mystery is also a good choice. If there is an up side to “Gidion’s Knot”, yours truly is thankful that she is no longer gainfully employed as a teacher. Teaching kindergarten and second grade in the ‘60’s was a picnic compared to now.